« MUISM 2009 XMAS GROUP GIFT!! I hope you guys well have a good one, i really didn’t wanted to say goodbye to 2009 in RL , it was a hella of a good year for me and i fear that 2010 won’t be so good for me….ehhh but I AM HOPING it won’t turn out as bad as i think it will be!! 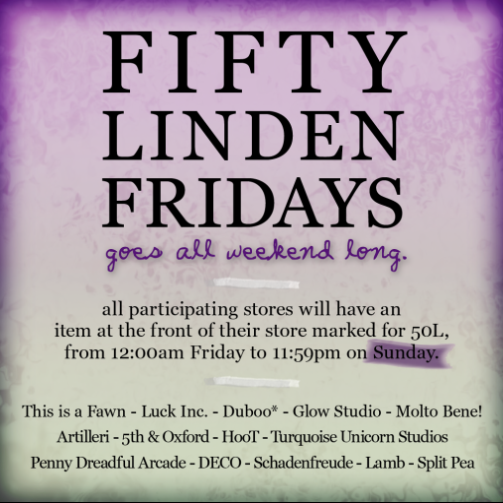 So let’s get down to the FiftyL Friday list!! Oh boy it’s a weekend one!! Whhoopppiiieeee!!! THIS FRIDAY’S ITEMS WILL BE OUT ALL WEEKEND IN ALL PARTICIPATING STORES!